Urban Horse Promotes an Easyboot Glove Back Country Hoof Boot from Easycare. Easyboots Are Tough Wearing and Exceptional Value For Money. Helping Bring a Natural Balance Back to Your Horse or Pony! The Easyboot Glove Back Country is the ground breaking new boot that takes the very best from the top selling hoof boots; Easyboot Trail and Easyboot Glove to make a 'super hoof boot' in the form of the Easyboot Backcountry. The Easyboot Back Country is made in 3 parts, which can all be replaced individually if required making the Back Country hoof boot great value too as you never need replace the whole boot! The foot part is a glove shell which gives the form fitting, quick breakover and superb traction of the ever popular Easyboot glove hoof boot. The upper consists of two pieces, the neoprene heel cup which is very soft and protects the heels area and back of the pastern from any rubbing and the front cordura covered neoprene portion that wraps around the top of the hoof to hold the boot securely in place. The end result is a very sleek boot with all the competitive advantages of the form fitting glove, but the security of the Easyboot trail. Easyboot features are as follows - See Additional Images! Stretchy boot material for a smooth, snug fit. 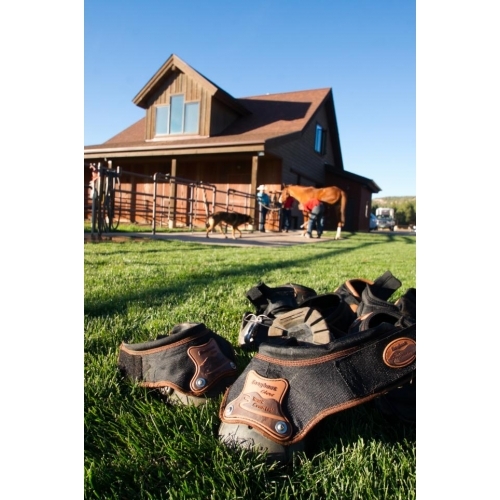 The ideal hoof boot for the performance horse. Available in Sizes - Please See Size Chart Below! If you are already using the Easyboot gloves with a power strap in place, you should find the same size Easyboot Back Country will fit. If you use Easyboot gloves without a powerstrap and find them a very tight fit, you may find you need to go up 1 size as the front of the boot is as if there is a power strap fitted. If you have never used Gloves before, we recommend ideally trying the glove fit kit to determine size, or if working from measurements alone as long as they fall within the same size they are usually true to size for the measurements (unlike gloves where you usually go down 1 to 2 sizes). The fit kit will however allow you to see if the shell shape is right for your horses hoof angle etc so if in doubt hire a fit kit first! 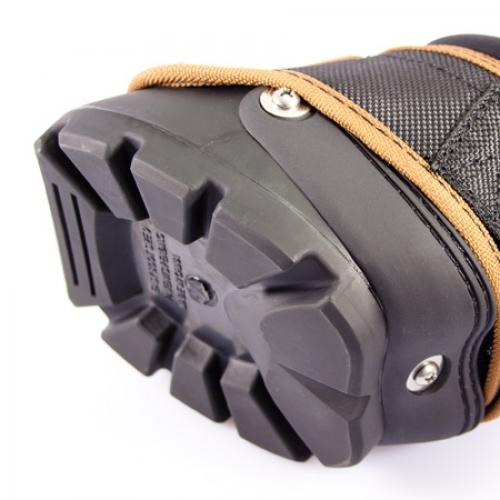 The Easyboot Glove Back Country should fit heels that are bulkier as the cordura is longer than on the Easyboot Trail/ Old Mac G2 hoof boots. Suitable for: Horses with slightly longer than wide hooves. Ideal for long distance riding, endurance or all day rides but equally suitable for any horse whose measurements fit the size chart correctly for day to day riding, schooling and competition (where permitted). A brilliant all round boot offering the lightness of the glove but the security of a boot fitting over the whole hoof. Not suitable for: Horses with round, flared or wider than long hooves, hooves that do not fit within one glove size category. Or horses requiring thick pads for conditioning or rehabilitation as the back country can only be used with 6mm pads. 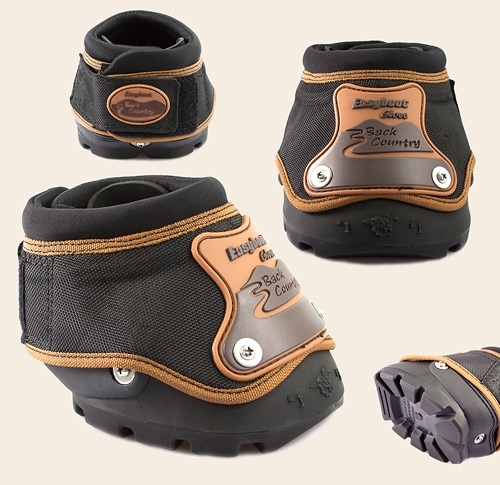 The Easyboot Glove Back Country is a totally new and innovative hoof boot from the Easycare range that gives a form-fitting, seamless fit. 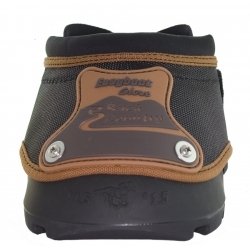 The Easyboot Back Country hugs the hoof and responds like a naked hoof, thus being the next best thing to being totally barefoot. The Easyboot Glove Back Country is flexible yet tough, and adds traction to the hoof whilst allowing a free stride and quick break over. Just like a glove on a hand, this hoof boot provides protection without stifling mobility. The material the Easyboot Glove Back Country is made from stretches over the hoof and clings to the wall so that debris stays out of the boot, even through sandy and muddy conditions. * Please note that the use of any hoof boot over metal shoes will invalidate the warranty. For any assistance with choosing the right type and size of Easycare Hoof Boot please do not hesitate to email us on sales@urbanhorse.com or call us on 01434 422700 01434 422700 - We are here to help you find the right boot for your horse / pony!